Diagram of a table cut. Georgian diamond brooch in silver, circa 1750. Diamonds have been set into jewellery since ancient times. The stones were probably worn as early as the sixth century BC, though the oldest extant examples date from Ancient Rome. During this period, however, the technology did not exist for cutting diamonds—the hardest substance on earth—and so the gems were set in their natural form, an octahedral crystal. Though not technically a cut as the diamond was largely unaltered from its natural state, these are now termed ‘point cut’ diamonds. It was not until the thirteenth century AD that the first true diamond cut appears, known as the table cut. 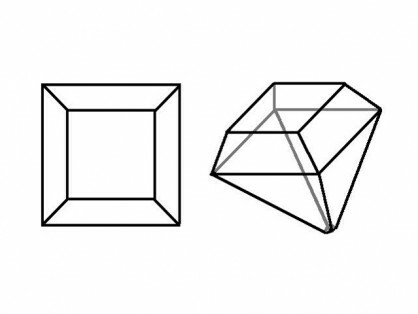 The simplest of all methods of faceting a diamond (or creating additional planes on the surface of a stone), it consists of removing the top and to bottom points of the octahedron. Though it is the hardest substance known to man, the crystalline structure of diamond is such that a relatively weak plane exists in parallel layers through the stone from top point to bottom point, which can be ground down with the application of another diamond, and then polished with diamond dust. This technology likely originated in the Middles East or Venice, along the major trade route from the sole source of diamonds at that time—India—to the courts of Europe. The ability to grind further facets, as seen on modern diamonds, would not be possible until the invention of the rotary diamond wheel during the fifteenth century. Table cut diamonds set into Medieval and Renaissance jewels are extremely rare, as diamonds were highly uncommon and, as a result, very valuable at the time. Often colourless stones, such as quartz and white sapphire, were cut in this manner to mimic diamond. Furthermore, most old table cut diamonds were subsequently unset and re-cut, once technology advanced, over the following centuries, rendering any such jewel a remarkable survival.